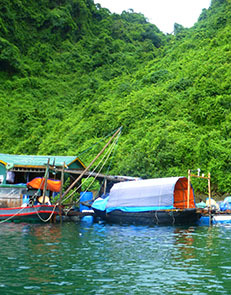 Hanoi, Halong Bay, Lan Ha Bay, Bai Tu Long Bay, Hanoi. 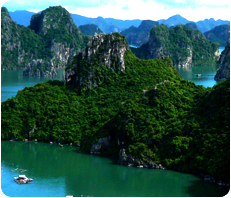 This is a remarkable journey through two different bays of Halong Bay and Bai Tu Long Bay. 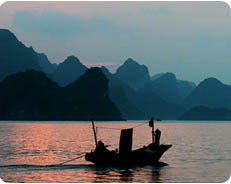 We travel from the sheer limestone peaks of Halong Bay and on to the delights of Bai Tu Long Bay. 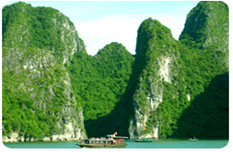 There's cruising, kayaking, cycling, cooking, beaches and homestay. Come and experience all now! 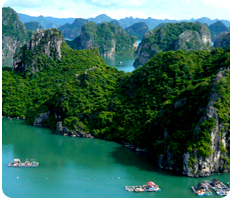 Halong Bay and Bai Tu Long Bay of the submerged dragon, which boast 3000 craggy and towering islets, are amongst the most picturesque places in Vietnam. 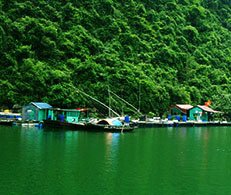 The fantastic beauty of the bays has given rise to many legends, some of them dating back to the ancient past. Departing Hanoi we journey to Ha Long City. 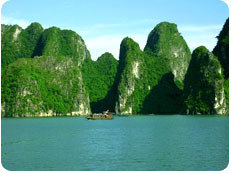 Upon our arrival we embark on a boat trip among some of the spectacular limestone peaks. We navigate to places out-of-the-way and find scenic spots. 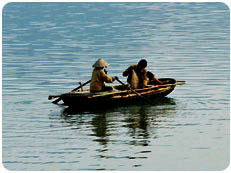 Here we settle our boat for swimming and taking a kayaking ride to exlore the bay. 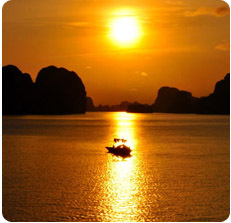 It is one of the best ways to relax and appreciate the sublime beauty of the bay. 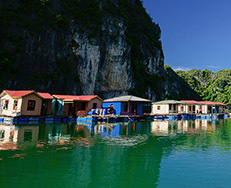 Well off the tourist trail, we indulge in Hang Trong, a beautiful spot, perfect for the night on our boat. (Lunch and dinner are included). 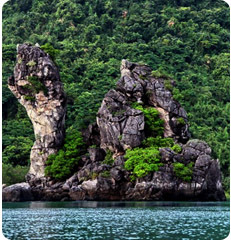 A morning boat trip brings us to some of the bay’s truly awesome scenery – vertical and unusual rocks and islets emerge from the sea. 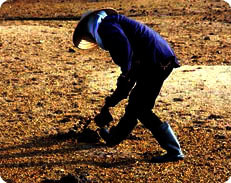 Weather permitting, there will be an opportunity to swim in the clear waters. 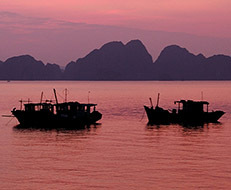 Leaving Halong Bay, we drive due north to Cai Rong Island. 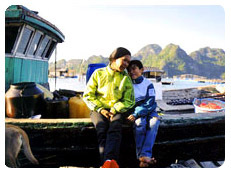 In Bai Tu Long Bay we enjoy a beautiful boat trip among the spectacular limestone peaks. 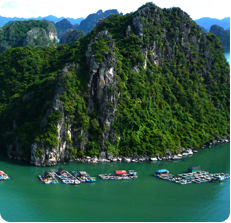 Weather permitting, we take a kayaking ride through stunning rock formations and fishing villages. 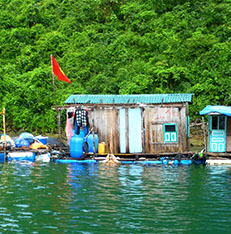 Arriving on Quan Lan Island, a serene and beautiful island in Bai Tu Long Bay, we head to our lodge. Our lodge is tastefully designed with textile and bamboo accents on the bedding, adorned with traditional furnishing, the room is peaceful and exotic. 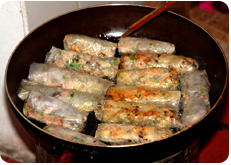 At our warm and friendly lodge we have the opportunity to learn to make traditional Vietnamese Spring Rolls and succulent fish dipping sauce and Squid dish. Tonight we stay overnight in our comfortable lodge. (Breakfast, lunch and dinner are included). 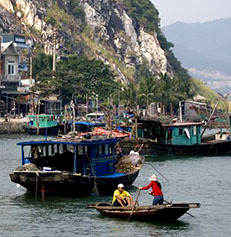 There is so much to see and do on Quan Lan Island - why not get a feel for the island by exploring an early fishing market or taking a quiet morning strolling around the picturesque village of Quan Lan and watching the day unfold on the island. 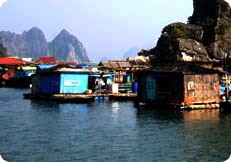 Next, we take a bicycling ride across the island before we board our boat to discover further northern reaches of Bai Tu Long Bay. We find a beautiful spot for taking a delightful kayak ride among vertical rock formations. 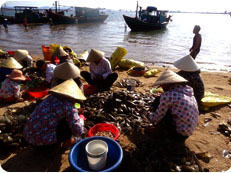 Finally we navigate to Cai Rong Island. 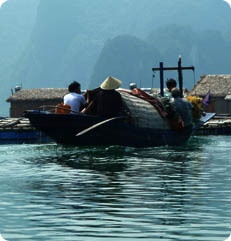 This is followed by our journey back to Hanoi, arriving there at about 6pm. (Breakfast and lunch are included). - a 2-3 hour kayaking ride on Day 1. - a 1-2 hour kayaking ride on Day 2. - a 6-10 km bicycle ride and a 1-2 hour kayak ride on Day 3. 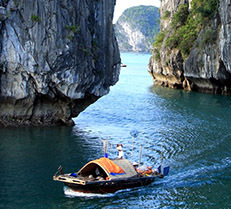 Price: $178USD per person for a group of 14 to 16 people maximum. 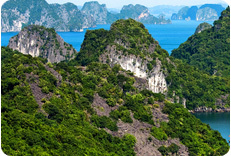 Pack essentials for a few days away from Hanoi including light comfortable clothes suitable for outdoor activities, comfortable walking shoes. Take a small day pack for cycling and walking.